After receiving some gift cards to Lancaster Homebrew over the holidays, I finally invested in a Brewer’s Best kit to start my own homebrewing. While at the store, I attended an open class to actively participate in and learn the steps for brewing your own beer. Per the instructor’s recommendations, I bought ingredients for my first batch simply by getting a pre-built kit and following the recipe. 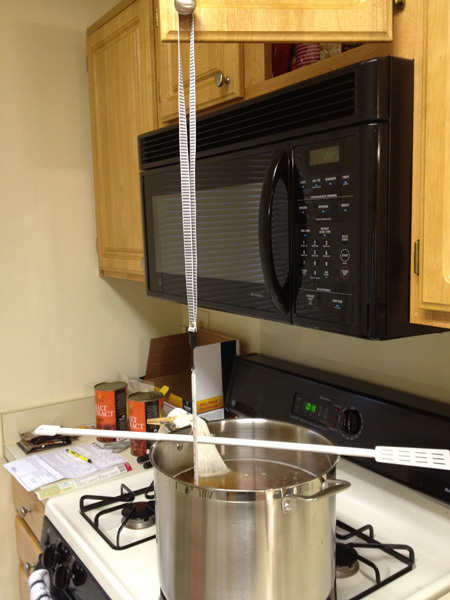 Improvised way to suspend the thermometer while steeping the grains. At the turn of the new year, IPA kit in hand, I had my first Brew Day. I invested in a 40 qt stainless steel stock pot to use for the boil. Realizing I didn’t have anything to mount my thermometer like the class did, I improvised with my cabinet door and a lanyard. I was happy to see how quickly my apartment filled with the scent of hops once I began the boil. Who needs air fresheners when you can boil hops every so often? The first few days after Brew Day I got anxious about my fermenter’s location. Finally, I settled on a coat closet near the front of my apartment. About 36 hours in, the batch was in active fermentation. I decided to not transfer to a carboy for this first batch, even though my kit included one. I’ll add in this step for my next batch as I found out during bottling day how much sediment accumulates on the fermenter. After asking the question to the Google+ Homebrewing community, I decided to cut a small portion of tubing from the auto-siphon. 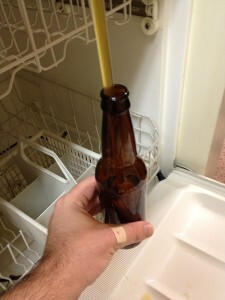 This allowed me to attach the wand to the spigot of my bottling bucket and suspend it from my counter. I opened the dishwasher door below to catch stray drops between bottles, which I found to be very useful advice. Filling my bottles over the dishwasher door – complete with a battle wound while trying to attach the auto-siphon tubing. Having someone help during bottling sped up the process, it took about an hour. I filled each bottle while my assistant dipped the bottle in sanitized water and capped the filled bottles. My 5 gallon recipe yielded me 46 12 oz bottles. I plan to share these with many of my friends in the coming days as they have just completed bottle conditioning. There are few things I’m going to change for my next batch other than including the carboy. I plan to invest in a wort chiller as I found the ice bath to be a tedious process that took much longer to cool after the boil. I want to keep things as sanitized as possible after the boil, which is the one thing I’ve learned is most important about homebrewing. A quicker time to cool means less chance that the batch can become infected. Additionally, I will look into a mounting clip for my thermometer so I can do away with the lanyard. I will most likely invest in another kit for my second batch, but I will put my own twist into one of the steps to make it my own. Last updated by Kenton Martin at January 27, 2013 .